Oi fifth graders! Como vai? (How are you?) Bom (Good) I hope! I keep learning more and more Portuguese. Good thing my traveling partner, Kaylea, bought a dictionary in Sao Paulo. We’ve used it a lot here at the boy’s orphanage in Maceio, Brazil. What have you been up to? I got up at 5:30 a.m. this morning (that’s 3:30 a.m. Joplin time) because the birds were singing and the sun was way up in the sky. The sun rises at 4:30 a.m. each morning, and sets at about 6 p.m. It gets dark here really fast. There’s not much to do here at night, so we go to bed by 8 p.m. Last night we ate the shrimp we bought at the fresh fish market. 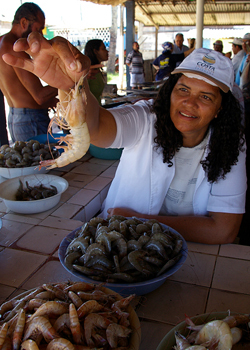 The market was on the beach, and you went up to the counter and bought shrimp laying in bowls of ice. The jumbo shrimp still had their heads on them. It was really different than our markets in the United States. 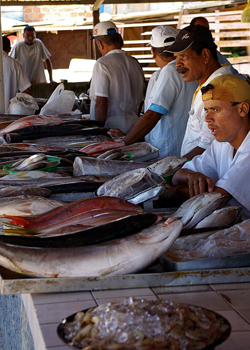 They also sold fresh fish, that looked like they were just pulled from the ocean. What a change from the fish sticks they sometimes serve in the cafeteria at school. I’m learning lots about Brazil. 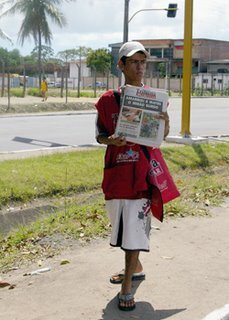 I hope to go shopping soon, and see what it’s like in a Brazilian store. 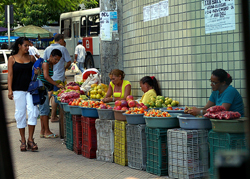 I think we are also going to check out the open air market. I’m sending back pictures from the fresh fish market (wait until you see how big the shrimp was), a picture of me with some of my new friends at the orphanage, and a picture of my new friend Clarence. 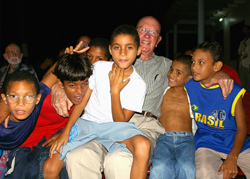 He’s 93 years old and still traveling to places like Maceio, Brazil, to help children. (You’ll be able to read more about him in Kaylea’s story on JoplinDaily.com). I’ll try to write again tomorrow, if not, I’ll send you some notes and pictures this weekend.